Huy Bui speaks about his plants the way some people speak about their children. His eyes widen. He smiles. He tells stories with the energy and awe of someone who’s been witness to the beginnings of life and all the magic of notable “firsts”: first blooms, first blossoms, first signs of growth. To those familiar with Huy’s path as an architect, designer, and creative thinker, this makes sense. Fascinated with nature and the adaptability of plant life, the former banker has spent the better portion of the past three years tending to a project he calls Plant-in City, which marries smart design, technological innovation, and a deep appreciation for the natural world. Centered on stackable wooden structures made to sustain plant life in urban settings, Plant-in City installations serve as a reminder that science and art can coexist beautifully — and are connected in ways that transcend aesthetics. The artist himself appears to be someone who’s deeply connected, too — to his work, certainly, but also to the many joys of life. When he’s not ensconced in his Williamsburg studio, he’s reading at his apartment just blocks away, or walking his dogs (both of whom he shares with friends), or squeezing in a meal at the Manhattan restaurant he co-owns with his brother. He talks often about how lucky he is, and how inspired. Tell us about your background in architecture. You weren’t always following a creative path — how did you get your start? I went to school for finance and worked in real estate banking for six years afterward. At that point, I was really feeling like my career had run its course, and I was ready to move on. The people I was working with were spending lots of money to live a certain kind of life, and I thought, I can’t do this. I can’t get used to this. It didn’t feel right. So I saved some money and went back to school for architecture at Parsons here in New York. I didn’t know exactly what I was getting into at the time, but I needed an out. How did your friends and family react at the time? They were supportive and pleasantly surprised. My father had a banking company, and had wishes for me to take over. But I had realized there was so much more to life than being a part of a system that was so limited and ultimately didn’t make any sense to me. By the time I graduated in 2007, the economy was failing. My father lost his business, and the whole financial system collapsed in 2008. Meanwhile, I had this new set of skills, and I wondered if maybe I had seen all this coming from afar. At the time, my brother was working in banking, too, and was also experiencing a change of heart. He decided he wanted to open a restaurant. I was working at a design firm then, drafting and drawing all day, and I said, “I barely know what I’m doing — but I can help you.” So I quit my job and did that. The restaurant, An Choi, is now a Lower East Side mainstay. Had you ever envisioned that you’d be working in the restaurant industry, or was that a somewhat unexpected development for you? I never had a desire to be in the restaurant business, but I was interested in the design side of things and it was a great opportunity to collaborate with my brother, Tuan Bui. It was my first time designing a space like that, and it became a sort of tangible portfolio for me — one that people could walk into, experience and call home in New York. It really opened the door for other possibilities. That was a big year for me. It was 2009 — we opened the restaurant, I moved to Brooklyn and acquired a rare 1992 2dr Jeep. It was the beginning of a new era. Just after that in 2010, I launched my design studio, HB Collaborative, in Williamsburg. Tell us how Plant-in City — which you’ve said “takes terrariums to the 21st century” — came about. What’s your history with horticulture? To be honest, there is no history. I knew nothing about plant life when I started. But I knew I wanted more of it in my day-to-day. I grew up in a beautiful suburb in Northern Virginia, so as a kid, I was always out in the woods, biking, running around. I was a wild child. As an adult living in the city, I realized I wanted to continue to be around nature as much as possible. Working 50 hours per week in the shop — especially during winter — was starting to feel suffocating. I began to think about ways to feel more balanced, and plants were a part of that. How do you describe the concept behind Plant-in City to those who have never seen it? Does the project have an elevator pitch? I’ve lost sleep over that question. In the end, the elevator pitch is this: Plant-in City is architecture for sustaining plant life. Living in a city like New York, you’re always going to be dealing with space constraints. Apartments are stacked to save space, so I thought, why can’t we stack plants? We have to go vertical. That’s the baseline idea. The idea for Plant-in City came about in October 2011, and my partners and I launched a Kickstarter campaign to raise funds the following June. Jon Schramm and I had been working together at HB Collaborative, building custom furniture — we did all the design and the construction of the structures, and the planting, too. Carlos Gomez de Llarena’s focus was more with computers and user interface, and he came up with a proof of concept to water the plants by iPhone. What’s surprised you most about working with plants thus far? After dealing primarily in wood and metal, it must have been quite an adjustment, working with a living thing. I’ve learned so much. Plants are very resilient. They’re responsive. They need care and attention, just like anything else. I even find myself talking to my plants when I’m alone. I’ve also found that plant life is very mysterious, very unpredictable. In my shop, I have a full-spectrum LED light and all the plants below it are leaning in its direction. That was such a cool thing for me to see. What’s more, it reminded me of one of the things I love best about Plant-in City: that I get to explore new technologies and find interesting ways of working with them. That LED light came onto the market, and it was such a breakthrough — suddenly I could grow plants in a place like my studio, which has very little natural light, without driving up my electricity bill. It was such a major innovation that the scientists who invented it won the Nobel Prize for physics. That I can use that technology for Plant-in City is a very exciting thing. Have you always had a mind for science? I love science, but never had the discipline to follow that career path. But to be any sort of scientist/artist hybrid is a dream. Do you have a favorite material — or plant — to work with? I love walnut. It’s a very common tree in the Northeast, and it’s beautiful. As for plants, my favorite has to be the asparagus fern. They look very delicate, but they’re extremely hardy. They’re like tiny trees. When their leaves catch water, it lingers so that it creates a sort of translucent skin. 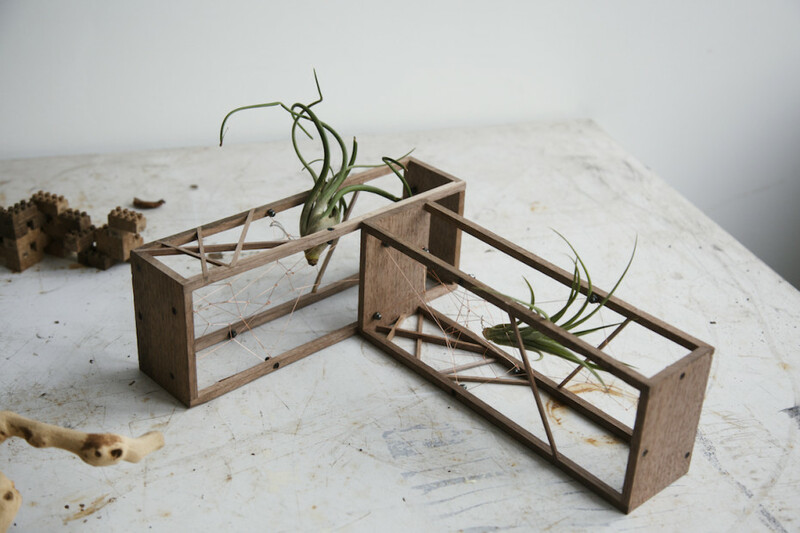 I’m also fascinated by air plants — they’re very spider-like. And because they don’t need soil, they can be suspended in space. That was the inspiration for the wire architecture used in Plant-in City, which has been very popular. Tell us more about the Kickstarter campaign for Plant-in City in 2012. What are your thoughts on crowdfunding, and how do you think platforms like this have changed the way artists connect with their audience? Launching our Kickstarter campaign was a very exciting experience. It was unlike anything I’ve ever done. I highly recommend it. It’s very challenging, rewarding, and very grassroots, and it really forces you to be thoughtful about your idea. It makes you think, what’s the best way to tell our story? As for crowdfunding, you’re sourcing from family and friends and total strangers, but you’re sourcing PR, too — TreeHugger wrote about us, and Wired, and Fast Company, too. Also, we thrive off of deadlines, and with Kickstarter, you have only a certain amount of time to raise money. During the campaign we had a diverse experience of introducing our project online and offline to our audience. We hosted a couple of events and posted shamelessly on Facebook. In the end, we got so much out of it, a captive audience, excellent press and some funds to make the Plant-In City Art Installation at the Mark Miller Gallery a reality. Huy has created a limited run, reclaimed teak edition of Plant-in City for FvF. Going forward, how do you see the Plant-in City concept evolving? What excites you most about how it may change in the future? I’d love to work on some sort of permanent, large-scale installation — something along the lines of an indoor park. Everybody thinks of park space as an outdoors thing, but what about building a modular jungle indoors? I’ve done pop-up installations in the past, but I’ll have a space for only two or three months at a time. I’d love to have something longer term — see it stay, watch the plants grow. The truth is, there’s a lifetime of work here, and that’s exciting. This is still such an early phase of the journey and we’re working with a very versatile medium. The plant world is just so dynamic. Let’s talk a bit about your history as a New Yorker. You’ve lived here in Williamsburg for the past five years — what do you love about it? I like that it’s a little disconnected. It can be challenging to get here, for New York standards, at least. And it’s not too crowded — it feels a little like a small town. Anytime I don’t have to go into the city and I can just hang out here in the neighborhood, I’m so happy. As for favorite places: I love Marlow & Sons and Diner. They opened here before it was a popular area, and now I think they define the area. You go and have coffee in the morning, you see the same faces. I’ve made so many friends just hanging out there. And in the spring and summer, you can sit outside — you feel like you’re in Europe. And your apartment? What about it makes you feel at home? Many things, but definitely my wooden table. It’s an old pocket door. Recontextualized as a table, it’s an interesting combination of industrial materials and things that are much older — for example, the legs are a stair banister that I sliced into four parts. For a while, we kept it at the restaurant, as a communal table in our bar space. I love family-style meals, and it can fit 15 people. Over the years, there have been so many memories attached to it — so many parties, so many birthdays. I think we even had Thanksgiving dinner on it once. It has a lot of history. I’ll take it to the grave. Have you thought about living anywhere other than NYC? I’ve considered LA, and I’ve thought about moving upstate. I’d love to buy some land and build treehouses for artists’ residencies. I also love the South of France. It’s close to the water, the food is great, and the creative energy is amazing. It’s as magical as it gets. I was there about a year and a half ago, at a wedding in Aix-en-Provence and I fell in love. If asked to pick, would you say that’s your favorite place to vacation? I love to travel, but my work is a holiday. I’m very lucky. I’m happiest when I’m in my shop, making things. I have moments here that remind me of when I was a kid, five years old, playing with Legos. My parents would say, “come down to dinner!” And I’d be ravenous. But then I’d think, wait, just a minute. I have to finish this. Huy, thanks for chatting about the importance of greens in confined spaces and how we can incorporate plants in our urban environments. Huy has created a special edition of his delicate Plant-in City Air Terrariums for Freunde von Freunden, have a look here. Get acquainted with more creative and innovative minds in New York through our past interviews.